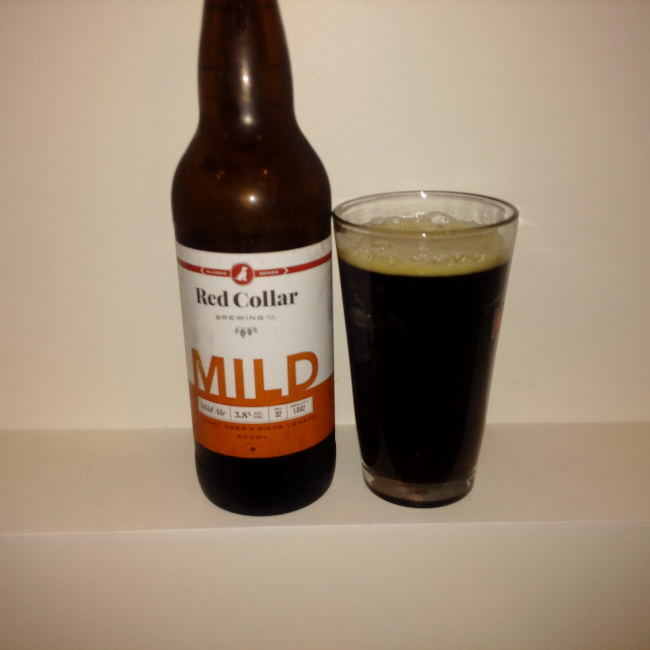 From Red Collar Brewing in Kamloops in the Okanagan comes their “Mild Ale”. The beer pours a deep brown colour with a tan head. The aroma consists of roasted malts, mild coffee and an overall sweetness. The flavour is of burnt coffee, roasted malts, earth, chocolate, caramel, citrus, herbal and grassy hops and a mild bitterness. The alcohol content comes in at 3.8% with an IBU of 32. I found it hard to believe that there was so much flavour to this beer with a sub 4% alcohol content. This is a great beer and I will be hunting down more bottles of it for sure! Commercial Description: A traditional English Mild which came to the height of its popularity in the early 1900’s when this style accounted for the majority of the beer brewed in the U.K. Red Collar Mild is brewed with Kamloops water, Canadian malt, Ale yeast, Ahtanum and Mosaic hops. Unpasturized, unfiltered and naturally carbonated. This entry was posted in Mild Ale, Session Ale and tagged beer, burnt coffee, caramel, chocolate, citrus, coffee, craft beer, earth, grassy, grassy hops, herbal, herbal hops, kamloops, mild ale, mild bitter, mild bitterness, okanagan, red collar brewing, roasted malt, roasted malts, session ale.